Social media is slowly being adapted by dentists looking to expand their dental marketing reach. Marketing statistics company Hitwise reported that one in every eleven visits to Internet sites in the U.S. were to Facebook last month, with the site itself accounting for one in every five page views. 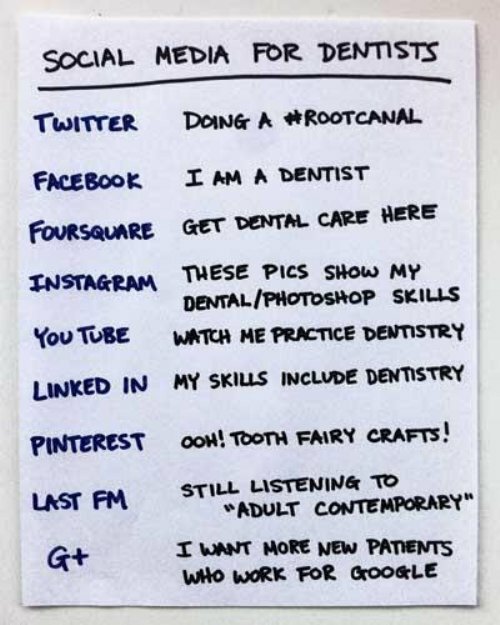 But some dentists are hesitant to take part in this new “social media revolution” claiming that keeping up with the different social channels is confusing. Recently Douglas Wray posted an image on Instagram (the photo-sharing service for iPhone users) of all the major social media services as compared to donuts (yes, he spelled it “donuts”). The image has now gone viral. Here at The Wealthy Dentist, we thought we’d provide our dentists with our own version of the “donut social media” definition . . . dentist-style. The value of social media comes from using social media as a communications channel. With a few simple dental marketing tools, a dentist can offer patients a new level of customer engagement reminding them of your services whenever they are online. Please feel free to share this and let us know your thoughts!